Not everyone can buy a brand new BMW motorcycle equipped with a full touring package. Likewise, not everyone can drop the cash to stay in a warm hotel bed every night of a moto-tour. A lot of the time, even those people who do possess the financial capabilities choose not to stay in hotels. 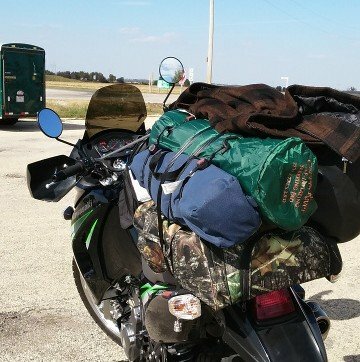 Touring the country by motorcycle is rough. It’s exhausting. It can drive you to your limits. But above all, it’s fun. From big tourers down to their sportier counterparts, pricier motorcycles made to tackle the task of distance will adequately do just that. 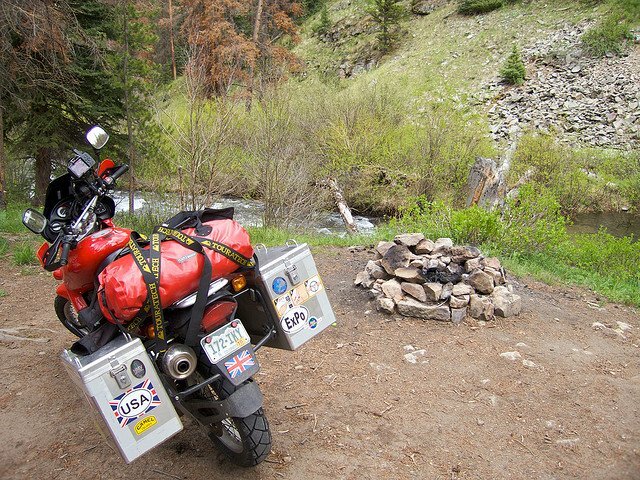 But on the rawest side of adventure touring are the one and two-cylinder dual sports, and although they are made for both road and off-road use, you need to prepare accordingly if you plan on doing both for a multi-day trip. If you’re really going all-out ADV touring, you’re hitting the roads less traveled (or lack thereof), and you’re camping, too. This can pose a problem to riders of 650cc bikes with little to no real luggage solutions on stock models. The ultimate swap out with budget touring is expensive cargo bags, boxes or panniers for simple sets of ratchet straps and duffel bags. You can also use other cheap old bags you have laying around the house. The two real sacrifices made are with security and weather protection. With strapped-down bags, you’ll have to keep a close watch of your gear at gas stations and food stops, which isn’t too much of a hassle once you get used to it. The bigger issue is rain. You can bring a light-duty small tarp or find a simple and relatively inexpensive dry-bag, although the cheaper models will not offer extra compartments or zippers. If waterproof gear isn’t an option, just expect to pull off in rainstorms and seek temporary shelter. Heavier storms can be a bigger issue, but you don’t want to be riding in that regardless of the weather protection rating of your luggage. Next to lodging and the bike itself, luggage will make for the biggest money gap between budget and “luxury” touring, and you may want to just drop the money for more protective bags or boxes. It’s all a matter of preference and available funds. While riding with a backpack can be strenuous, and even harmful to your back if the pack is too heavy and on you too long, it doesn’t hurt to bring a small backpack. As long as you aren’t going remote wilderness, you can solve your food problems when you get near your campsite. Leave the backpack empty and strapped to your gear for the long rides, and stock up on what you will need at camp when you get close enough to comfortably carry a back load. If you’re young and/or capable, leave the sleeping pad behind. Unless you have back problems or serious issues with sleeping in a tent on the grass, you don’t need one. A long day of riding, whether on pavement or trail, will leave you exhausted enough to doze deeply on the natural ground. Even light variety self-inflating cell pads take up space when rolled up. A tent is the one thing you should splurge on. Get a tent strong enough to withstand howling winds and heavy rain. Altogether, you can get by with a duffel bag with clothes, tool kits and personal items. Your tent and sleeping bag can remain outside of the duffel. The whole bundle can be easily ratchet strapped to any rear hook or handles on the bike. Use a few straps just to be safe. Another option for the small items you want easy access to is a tank bag, which can be easily removed and taken wherever you go when it attaches to the tank using magnets. Despite all the preparation that goes into adventure touring, problem are bound to arise, even on those shorter couple hundred-mile trips. On the more serious end of the unavoidable problem spectrum are wrecks and breakdowns. One of the best choices any motorcyclist can make, regardless of hours and miles logged each year, is an American Motorcyclist Association membership. For only $49 a year when signed up for automatic renewal, Roadside Assistance is offered. They will tow you for up to 35 miles to the nearest service facility or wherever you need to go. Other perks include a subscription to American Motorcyclist Magazine and other members-only discounts. Info is available at AmericanMotorcyclist.com. The best you can do is to just make sure to avoid the avoidable, like running out of money. It will get you through in a pinch. Just because it’s budget touring doesn’t mean you should expect free touring. Have money or a credit card stashed somewhere where you won’t use it for regular expenditures, and turn to it only when times are really tough. For a look at the new 650cc dual sport bikes this year click here.